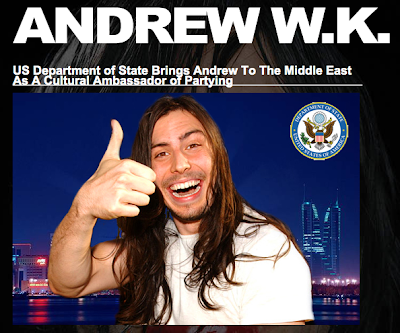 The internet was abuzz yesterday with stories that Ann Arbor native, Andrew W. K., was going to be named Cultural Ambassador to Bahrain. Unfortunately the State Department decided that Mr. W. K. did not represent the image of the U. S. that they wanted to present to the Middle East. According to a post on Andrew W. K.'s Facebook page "After a year of planning, the US State Dept. just canceled my Middle East trip because I'm too party." Too party indeed. Boooooo! Did they not think this same thought a year ago? Andrew W.K. would have brought a good time and a smile to all of Bahrain.